There are days when I simply don’t have the time to read all of the news emails that appear in Outlook, or in the half-dozen computer magazines I subscribe to. In this case, I guess I should have, because I missed a tiny story that turned out to be big news. (A lesson taught by Mrs. Jurow, when I was a fifth-grader at Ogden Elementary School in Valley Stream, NY.) Intel reported in late September 2018 there were “issues” regarding its ability to supply new eighth-generation chips — called Coffee Lake — to computer manufacturers (OEMs). You can read the announcement here: https://newsroom.intel.com/news-releases/supply-update/. Those eighth-generation chips were the ones I was counting on to be in your new Windows 10 computers. Sad to say, that ain’t gonna happen very soon. There is currently a “hold” on all those new Coffee Lake-based desktops and laptops. They are not in the pipeline from any of the major OEMs (e.g., Lenovo, Dell, or HP). To meet a higher demand for new computers, they are continuing to produce models with the existing seventh-generation chips (called Kaby Lake). Because of this unexpected need to switch gears at the end of 2018, shipments of all new computers are also being delayed. How long is the delay? Higher-end models are showing a two to three month lag. In one specific case, the mid-range models I wanted to order as replacements for a client on February 12 (when I originally wrote this article) have an estimated March 25 delivery date — six weeks. Here’s what this means for you. I am going to have to alter my timeline of deployment to include an additional six to eight weeks. That means I’ll be contacting you sooner than I had originally planned, and that you’ll probably have to wait longer to receive your new computer. If there is any change in the status of this debacle, I will let you know as soon as possible. I’ll be able to do that because I now have a Google email alert for all things related to Intel Coffee Lake chip status. After years of creating almost a dozen versions of Internet Explorer, in 2015, Microsoft introduced a new browser called Edge. This was released concurrently with Windows 10. The following year Microsoft announced that there would be no further development (meaning enhancements) to Internet Explorer (IE); only security updates would be issued. At the start of 2019, according to Net Applications, a company that measures browser usage around the world, almost no one uses the Edge browser (4%) and use of IE has plummeted to 11%. It comes as a stark reminder to realize that only five years ago, IE had almost 85% of the market share. I’m getting there, I promise. As many web developers have discovered, it is increasingly hard to code a web site to support a browser that doesn’t know about the latest features and techniques for displaying web pages. So a number of sites have simply said they are no longer going to run on IE. If you want to view or use their web sites, you’ll have to use another browser. I found this out with one client when she couldn’t get to her AOL mail using IE! All Windows 10 computers come with the Edge browser by default. But also contained in the operating system is the code to run IE 11. It has been my standard operating practice to remove the Edge icon from the taskbar and replace it with the one for IE. But if Microsoft is not going to issue anything other than security updates, and more web sites decide not to code for IE, I am making a mistake in providing it for you. So I took a closer look at the Net Applications statistics. To my amazement, my personal favorite browser, Mozilla Firefox has a 10% share – even lower than IE! And to my surprise, Google Chrome has a 64% share. It didn’t take long for me to realize that I need to update my standard deployment task for new computers. Going forward, I will install Google Chrome on all Windows 10 computers, and set that to be your default browser. I will port over your bookmarks (favorites) and saved information so that you can continue to use this browser instead of Internet Explorer. I will caution you that that Chrome is slightly different than IE. To help make this transition a little easier, if you want to start using it now, I will offer to install it on your current Windows 7 computer. That way you can compare and contrast how your favorite web sites appear with both browsers, and take at least a few months to wean yourselves away from IE. PS — After I wrote this article, Microsoft announced that they will be using the Google Chrome framework for future versions of the Edge browser. Notwithstanding that development (which won’t be released until later in 2019), I’m still going to install Chrome. In plain English, cryptojacking is the stealing the resources of your computer (processing power and electrical power) to mine a cryptocurrency. Data is “mined” on a computer by using special programs to solve complex, encrypted math equations to gain a piece of the currency. Cybercriminals are always looking for the fastest and easiest way to conduct fraud, and one was revealed in late 2017. There is a company called Coinhive, which launched a service that mines for a digital currency, known as Monero, directly within a web browser. Anyone using the computer is completely unaware that anything is amiss; unless they realize their browser is running very, very, slowly. If you think that something is not quite right with your computer, please give me a call. I want to be sure your computer isn’t running software you didn’t know anything about (and generating profits for crooks). I have written about this before (and will undoubtedly do so again), but those phone calls you get from someone with a heavy accent, claiming they are from “Microsoft” or “Tech Support,” saying they have received information from your computer about problems that need to be fixed are nothing but pure crap! I’ll keep this simple: If you get one of these calls, just hang up. You can’t tell them to put you on a “do not call” list, they don’t / won’t listen to that. They don’t care. All they are interested in is scamming people. They get money from spreading FUD (fear, uncertainty, and doubt) to anyone who doesn’t know enough about computers to know better. These are incredibly vile profiteers, because after they have falsely convinced a suspect that something is wrong with their computer, and while purporting to help, they install malicious software on the computer and then charge — in most cases as much as $150 — to do this. So, save your breath, and especially your money. Just hang up the phone. Oh, and you really don’t have to call me to tell me you got one of these calls; my phone line would be busy all day. Microsoft will be ending support for Windows 7 in January 2020, which means there will be no further updates. Shortly thereafter, I will stop support as well. While that date may seem far in the future, I can assure you that’s not the case! It is less than a year and a half away, and the majority of my clients will need new computers (along with associated hardware and software) between now and that deadline. I am affected by this as well; because I have to replace my desktop and laptop. This early reminder is designed to let you begin planning a budget for a refresh. Based on the current political talk and potentially looming trade tariffs, it is possible that computers could cost more for consumers and businesses before next year. However, I have no idea when (or if) price increases will take place, nor by how much. You can use the following approximate numbers: $800 for a computer, $200 for a monitor, $150 for a printer, and $500 for me to do the necessary work (assessment, procurement, system set up, installation, and file transfer). I have a chart with the warranty information for each of my clients’ computers. I will send you a letter 60 to 90 days in advance of its expiration to find out how you would like to proceed. Some of you may decide you want to move to an Apple Mac, others may opt for Ubuntu Linux, and still others Google Chromebook. We can discuss those options in the coming months. Please note that recently purchased Windows 7 computers are eligible to upgrade to Windows 10 for free. I will contact Lenovo to obtain the software update for you. Other Windows 7 computers may not be eligible for free software, but could still run Windows 10 (an additional purchase). Again, I will discuss these options with you as well. Look for more frequent reminders, along with Windows 10 usage tips, in future editions of this blog. Do Home Users Know How to Adequately Protect Themselves From Cyber Threats? Cisco Systems earlier this week released a report from its Talos cyber intelligence unit. It contained a warning of 500,000 routers and storage devices in 54 countries that have been infected with malware. Their findings (https://blog.talosintelligence.com/2018/05/VPNFilter.html) pointed to the Russian government as having sponsored the hack, calling it “VPNFilter,” and that the software was simply waiting for activation. With a high preponderance of these devices in the Ukraine, it seems that an attack might be pending, or at least imminent. I won’t bore you with the details (and they are voluminous), but the recommendations for how to thwart the hackers are quite interesting. End users are instructed to reboot their routers, modems, and network attached storage (NAS) devices to the factory default state and then to install the latest firmware. Internet Service Providers (ISPs) are instructed to reboot routers and cable modems for their customers and to ensure the devices are patched. Those two steps should, for all intents and purposes, knock out any of the malware that may have infected the devices. Here’s my question: How many home users – or business owners – know how to perform those two steps? I do, because it is something I learned a long time ago as part of my job. But I can’t see asking any of my clients to do that. For one thing, the recommendations didn’t take into account the main task of saving existing settings – or at least writing them down – so they could be recreated after the device was flashed and rebooted. In a “best case scenario” I can imagine someone was using a Linksys modem they purchased from a big box store and they didn’t configure anything; they simply followed the installation instructions. But in all likelihood, the SSID (i.e., the broadcast name) of their Wi-Fi is going to change. That means all of their wireless devices – computers, printers, tablets, and phones – will also need to be reset. The report acknowledges that most of these devices are what we frequently call “set it and forget it,” meaning that they are expected to simply do their job once they’ve been installed. My concern about the recommendations centers on the fact that most individuals have no idea how to obtain the current firmware for these network attached devices. It isn’t very obvious from any of the manufacturers’ literature (and these include Linksys, TP-Link, and Netgear) that this is a task anyone should ever consider doing. Granted a half-million devices is only a small drop in the bucket in terms of world-wide network device distribution. Yet it seems we have entered into a new “normal” for what people need to do – and learn – in order to better protect themselves from cyber security threats. Microsoft issues its monthly updates on “Patch Tuesday,” the second Tuesday of the month. Since the beginning of this year it has tried to fix the critical issues associated with the Spectre and Meltdown problems. But in a totally unexpected turn, the March 2018 monthly update knocked Windows 7 and Windows Server 2008 R2 systems offline because the network drivers get clobbered after the computers were restarted. As a result, for the past two months I have blacklisted the updates; meaning I prevented them from being installed. In cases where I missed that phase and the computer had not been rebooted, I ran a script to uninstall the update. And in some cases, I was altogether too late and had to manually reinstall the network drivers. Unfortunately, the May 2018 monthly update was wrapped up with a critical security patch, so it was inevitable that I had to release it. And I regret it, because this last episode has pretty much worn me out – and I’m not done with it yet. Of all the vaunted software tools I have at my disposal, the most valuable one is remote access. However, when a client’s computer cannot connect to the internet that tool becomes useless; and I am forced into “break/fix” mode. So the second Thursday of the month has now become a day of running around to client sites and manually reinstalling drivers, getting internet access again, updating the drivers and fixing other elements that are listed as “Unknown” in the Windows Device Manager. Knowing that I’m shouting into the wind, I’m going to make this plea anyway. “Hey Microsoft! Could you please figure out a way to get this update to work properly without any extraordinary measures on my part?” I would thank you, and my clients would thank you. I received a phone call from a major distributor earlier this week asking me if I knew about a new line of laptops issued by the electronics giant LG. I admitted that I was a Lenovo partner, and was partial to their offerings, but I was interested in seeing what the competition had available. A short while later I received the email, the bulk of which is shown below. At first I was intrigued, because it looked like it was going to be a light-weight model that could be useful for some road warriors. That is until I got to the last word of the text, and I stopped short. In my head I heard the cartoon sound of tires screeching to a stop. I then re-read the title, “Professional Redefined.” At that point I was horrified because of the dissonance in the ad copy. It starts with the word “professional” in the first line and ends with the words “Windows 10 Home” in the last. If “professional redefined” means using consumer-based products in a business environment, I am absolutely and totally against it. I am a managed services provider (MSP), and I sell IT support services to small businesses. One of the main points I make as an MSP is that a business must use business-class (or even enterprise-class) products, because they are designed to be properly managed, provide greater security, and offer additional features used by businesses. Windows 10 Home does not fit in those categories at all. 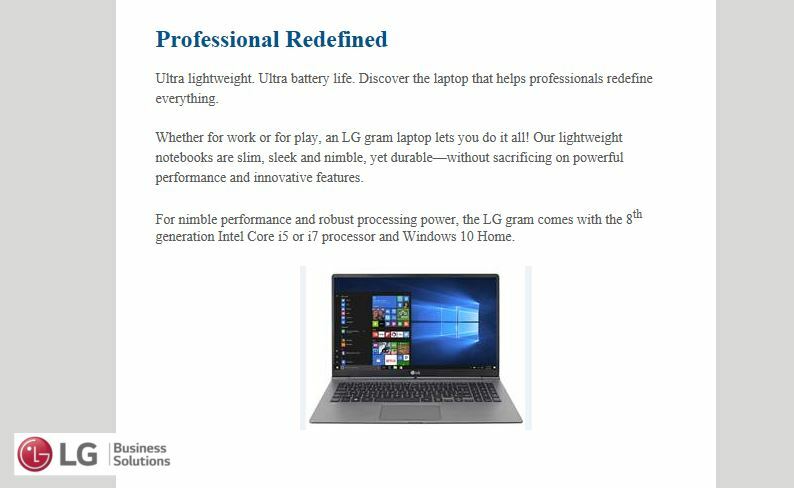 And no offense to LG, but if you are going to redefine the word “professional,” I would hope – very sincerely – that you would aim for something higher up on the scale, instead of lower. Well, that certainly got my attention, and I clicked on the link to read the article at Motherboard, and a lot of the associated links, and those associated stories and their links, and before I knew it, more than 30 minutes had gone by – and my jaw was just as slack at the end of that adventure as it was at the start. I’m going to give you the “Reader’s Digest” version because I don’t know if many of you are going to read that. Let’s start with the basics. Google Chrome is a browser, just like Microsoft’s Internet Explorer, and Mozilla’s Firefox, and Apple’s Safari. The browser lets you explore the pages on the World Wide Web. The focus of this article is that deep within the Google Chrome settings, there is a ‘clean up’ option that uses a third-party product (from antivirus vendor ESET) to scan for malware that could, potentially, harm the Chrome browser itself. One of the parameters associated with this option, “Report details to Google,” is defined as follows: “Includes information about harmful software, system settings, and processes on your computer.” And the default for this setting is to ALWAYS SEND the data to Google! Obviously, this setting lets Google’s developers know how to handle any problems that may have been encountered during the scan. Now that’d be great if Chrome simply scanned a few known locations in which malware frequently appears and then closed down. Unfortunately, as the reporter describes it, the scanner reached further into the computer than anyone would have suspected, and it was going through the My Documents folder. I can’t imagine that any malicious software would reside there that could cause any harm to the browser. So that’s just overkill. The exaggerated claim is that Google is spying on you, your files, and your computer. According to a leading Google developer, the scanner “only runs weekly, it only has normal user privileges (meaning it can’t go too deep into the system), is “sandboxed” (meaning its code is isolated from other programs), and users have to explicitly click” on a box if anything is detected. I looked into this, and it seems that this clean up “feature” has been in existence for more than a year, and is only now getting any reaction. But that’s the wonderful nature of the Twitter universe. Someone makes a discovery; some of her followers take a closer look and get agitated; a reporter asks a few questions, and then everyone gets all riled up about the intrusive nature of a global corporation. I doubt that any of my clients who have Chrome have EVER seen a pop-up that malware was found. And I know that many of you use Chrome and that some of you have encountered instances of malware. It’s simply that the software I have installed on your computers scans more frequently than once a week, is constantly updated, and – most importantly –I monitor the results (not Google!). While I would want everyone to turn off the setting that sends data to Google, the steps I have followed do not work for more than the logged on session. If you close your browser and then re-open it, the setting turns itself on again. I have checked, and it seems that this setting simply cannot be eliminated. What’s my recommendation: If you don’t mind having your machine bogged down every now and then by a scanner over which you (and I) have no control, you can continue to use Chrome. But I would really like to know if you ever get a pop-up from Google about malware. Otherwise, if you’d prefer a less intrusive browser, send me an email or give me a call and I’ll install Firefox and transfer your favorites. “Beware the Ides of March” is a well-known phrase for this time of year. Who knew that it would apply on Wednesday March 14, 2018? That was the day after Microsoft released KB4088875, which had the uncanny ability to remove the network card drivers from Windows 7 Professional and create ghost network cards in Windows Server 2008 R2. No, I am sorry, but I cannot remote in to your computer if you can’t get a network connection. I had to tell a number of clients that I was going to deputize them as “special assistant junior level 1 technicians” for the life of the phone call. In some cases it was a mere 15 minutes; whereas in others it clocked in at closer to 45. The major saving grace in all of this is that I deploy Lenovo computers to my clients. Fortunately the factory-installed network drivers are available for detection and installation directly from Windows (Device Manager > Unknown Device > Update drivers > Browse my computer), or indirectly via the C:\SWTOOLS\DRIVERS\NETWORK\INTEL folder (requires the user to click on the appropriate EXE file). Once the network card was re-installed and activated, it was a simple matter of gaining remote control to do two important tasks. The first was to uninstall KB4088875; that absolutely had to go. The second was to run Lenovo’s System Update utility to update the network driver to the current version, and to reinstall (or update) any other software that was removed. The most worrisome aspect of this little escapade: I’m not sure that all of my clients rebooted following Tuesday’s patch. So this issue is going to crop up again and again over the next few weeks as clients shut down and restart their computers. I have already run a script to uninstall the patch from those computers, but I may not have caught all of them in time. Similarly, I have blocked the patch from being distributed to the rest of my client base to prevent an onslaught of phone calls and irate clients. Ubuntu doesn’t seem to have these horrific issues on a regular basis. Although January’s attempt to fix the Meltdown issue did qualify as truly awful. So if a client only needs to browse the internet and obtain mail via a web browser, I am now, more than ever, inclined to move them to an easier to manage desktop operating system. Therefore, let me offer “Thanks!” to Microsoft for enabling me to break out of the Windows-only rut and consider an alternative desktop experience for my clients. Ubuntu puts a nice glossy coat on Linux, virtually eliminating the mystery of using a different operating system.